Two years ago, on this very day, I handed in my thesis to finish university. On the next day I was on a plane to Rio de Janeiro. Away from all the uni stress, away from the daily routines at the office, away from the -15°C (5°F) of the European winter. Off to Terra Incognita, the unknown land, off for adventures, off to beaches and (at least in theory) the endless summer. I have been on the road for 730 days now. I have visited 20 countries (plus Gibraltar) on four continents and went back to Germany three times. My passport boasts 33 Stamps and and got into trouble twice, because I was issued the wrong visa. 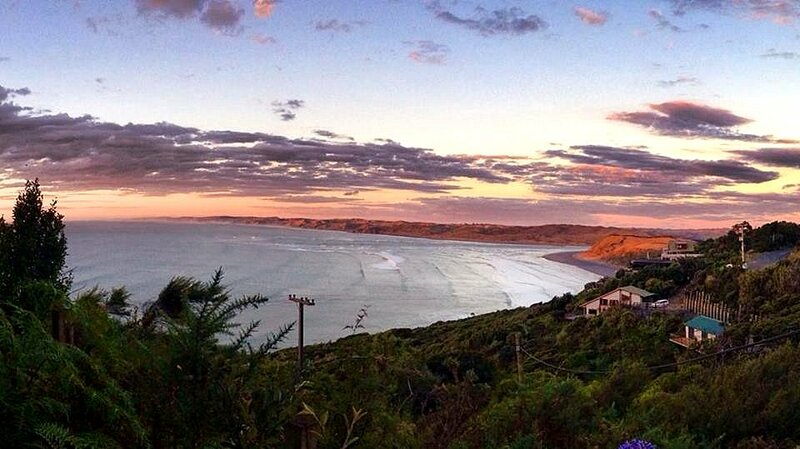 The view from Solscape in Raglan, New Zealand – my home for the past two months. On long distances I have traveled 111.800 kilometers (69.500 miles). That’s almost three times around the globe! 90.000 kilometers (56.000 miles) of which were on the 35 flights I took. The rest accumulated in overland and local buses, in private cars, on boats, ferries and rafts, on the back-o‘-da-truck, on rickshaws, bicycles, ATVs, kayaks and a punt. And I don’t even want to know how many miles I’ve paddled on my surfboard. In those 730 nights I slept in 105 different places. In my first six weeks inNew Zealand alone I moved 25 times – mostly not out of free will. Sorted roughly by frequency, I slept in hostels and hotels, at friend’s and couchsurfer’s houses, on couches and in tents (98 nights so far), in bus and airplane seats, in airports, train and bus stations, on the backseat of cars and cold floors, in cozy hammocks and not-so-cozy park benches, on a ferry and one balcony in a beach apartment. A big thank you, to everybody, who opened their home for me. I am endlessly grateful. I ate a whole guinea pig in the mountains of Peru, 3 kilograms (6.6 pounds) of grass-fed beef and dark red wine for breakfast in Argentina, tender heart of beef on a skewer, Marmite (yuck!) and shark in New Zealand, Pizza in Italy, ham-in-a-cone and paella in Barcelona, stroopwafels in Amsterdam, Swedish köttbullars with vodka, crocodile with hot sauce, banana pancakes for breakfast, A LOT of peanut butter (creamy AND crunchy) and got fed up with FRIIIIIIED chicken (hi, Owen!) and plain white rice in Equador. I had a picnic underneath the Eiffel Tower, ordered a Hot Dog in a busy Times Square, and tried all the unhealthy fast-food options the USA have to offer. But I also fell in love with Whole Food’s King Kamehameha sandwich, and tasted at least 246 different kinds of fruit, that I couldn’t even imagine existed (most of them in Peru and Hawai’i). On Maui I had roasted cacao beans, tons and tons of home-made guacamole, sweet coffee cherries, ulu, lilikoi, sweetsop, durian, prawns (thank you, Justin), a fruit, that tastes like peanut butter, the most incredible Thai food (go to Ae’s food truck in Hana!) and – against the claim of a well-known German folk song – decent beer. I have been drinking coca and mate tea, the best coffee in the world, beer at Oktoberfest in Munich and beer with pumpkin and chocolate flavor and chai latte. I had coconut water and spirolina, noni, red and white wine, caipirinha on copacabana beach, Inka Cola and L&P, which taste surprisingly similar. I’ve witnessed robberies, saw bones break, gangster with produced guns, and soldiers and policemen with rifles at the ready. I have seen cars, buses and food trucks crash and experienced earthquakes (7.1), flash floods and a tornado. I nearly got run over by a tank in the amazon and multiple times by cars (damn you, left-hand traffic!). I almost suffocated on a pill and got eaten up by parasites. I had to be rushed to the hospital on three continents (but never in Europe) and always had the best people I could have imagined around me to take care of me (and what man does not secretly wish to lie in a hospital bed, all covered in blood, while a beautiful blonde girl from Sweden is holding his hand, pitying him?). I have seen sunsets so beautiful you would not believe it over Africa, in Uruguay and Peru, in California and Hawaii, behind the skylines of the worlds biggest cities and on the Forche in my hometown of Weissach. In Chicago I even saw the same sunset twice (during a take off). I have seen the Southern cross, the horizontal half moon and have counted 36 shooting stars in one single night. I crossed the equator and the date line (the 17th of November 2013 never existed for me). I celebrated my birthday in Barcelona, Christmas and new years on a beach in New Zealand and Easter in South America. I have harvested coffee, bananas, papaya, avocados and fruit, I didn’t even know existed. On this blog I have published 57.059 words. That’s almost a average novel. I jumped of a bridge (two, actually) and multiple waterfalls. I went surfing at midnight during full moon, I played the guitar by a bonfire on a beach at night, I went sandboarding in the dunes of Chile, Brazil and Peru, danced salsa, hula and the haka. I have been swimming under waterfalls, in rivers, lakes and oceans. I have seen the beach light up like glow worms under my steps (although nobody will ever believe me). I scared a monkey off my backpack in Gibraltar and got pooped on by another one in Brazil. I have fed manatees (yikes) and crocodiles. I had encounters with mountain lions in California, Tarantulas in the Jungle, colorful fish and dolphins in the Caribbean, giant sea turtles and Geckos in Hawaii, possums in New Zealand, and in Argentina with unidentified insects, we named „the yuckies“. I went to New York, Paris, London, Zurich, Munich and Rio; to Lima, Amsterdam, San Francisco, Honolulu and I sometimes wished that New Zealand, too, had a real city, where I can find some god-damn coffeeshop that’s open at four o’clock on a Saturday afternoon. I went up the Empire State Building and walked across the Golden Gate Bridge, the Brooklyn Bridge and the Tower Bridge. I have climbed mountains in Switzerland, the Andes and volcanos. I dove in the Caribbean. I wandered through deserts and forests of bamboo, silver fern and tropical plants. Sometimes I drank too much and at other times I got dehydrated. I froze and sweated. I loved and ignored, but somehow never hated. I got disappointed and surprised. I waited and missed. I laughed a lot and sometimes I cried. I had conversations with a Brazilian millionaire, an Ecuadorian donkey farmer, a healer in the jungle of the amazon, a descendant of tribe’s king, Israeli soldiers, a teacher from the Arctic, a professional laser tag player, Hollywood stars, doctors, pro-surfers, homeless people and lately way too many German high-school graduates, who don’t know what they are going to do with their lives. A kiwi pilot took me to see his brother, who operates one of New Zealand’s most successful jewelries from a shipping container in his backyard. That’s where I almost dropped a tiny diamond – worth of 80.000 Dollars. Oops. I have met countless interesting personalities and made countless friends from all corners of the earth. I had to answer the same questions way too many times and I had to say goodbye way, way too often. But sometimes I was happy to leave. While I am writing these lines I feel completely overwhelmed. I can not grasp all the memories of people, moments, feelings and stories that come back to me all at once. But at the same time, so much will be lost in oblivion and hidden between these lines. Thank you, to everybody, who walked with me for a part of this journey (and be it only in your thoughts or by reading these reports). Thank you for sharing your time, your food, your home or thoughts with me. Thank you for picking me up or giving me a ride. Thank you for making me laugh or taking care of me when I was too stupid to do so. Thank you for making these two years so epic, so interesting, so educational, so fun and so unforgettable for me. Two years have gone by. I have never regretted to head out. On one hand, there are many things I would do differently now. On the other hand, a lot of things turned out better than expected. A lot things went unexpectedly wrong and some things could have been foreseen. The next year is still unclear. There will be some major changes. Because sometimes, I am sick of it, the life on the road.